Or my current obsession with my Kerala Cookbook! Did I mention that I got my hands on an old Kerala Cookbook recently? It’s an old school one, called the Malabar Cookbook presented by Mathrubhumi and Grihalakshmi – I think it was a special edition for a spice festival. AK’s grand uncle was responsible for compiling and editing the book and holds on to a few copies till date, to be able to give them out as gifts to friends and family. It was actually gifted to my MIL, but I managed to get my hands on it, leaving her with a photocopied version. Yes, I know I’m greedy that way. 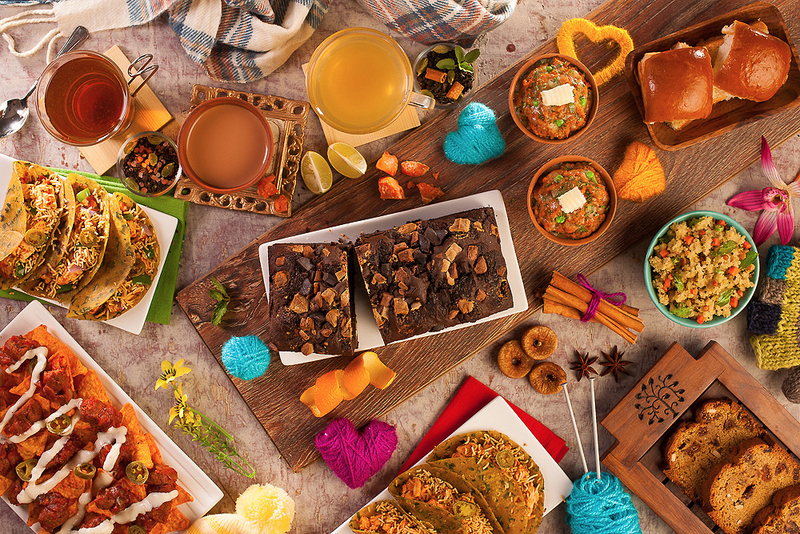 If you’ve ever tried searching for Malayali recipes online, I’m sure that you found a few drab websites (and I don’t mean blogs) where users contribute traditional recipes. There’s nothing wrong with those recipes, mind you. They’re as authentic as it gets, passed on through generations. But they have absolutely no photographs, some of the ingredients aren’t quantified (in fact some are just assumed) and even the method is written in a kind of shorthand. 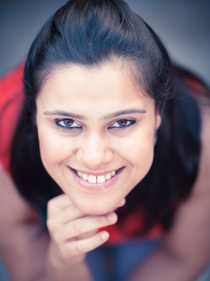 The contributors are not recipe writers or food writers who pay attention to the nuances of ingredients and methods. Like our mothers, they probably cook each dish on auto-pilot, from memory, perfect and exactly the same every single time. I truly envy such skill. Fortunately, or unfortunately, my generation is spoiled for choice with food blogs, online magazines, smart phone apps and glossy cook-books. I feel like I have lost the ability to just cook from memory – I fail to remember every ingredient and it’s quantity just because I have a phone that can pull up the info in 10 seconds. When I cook or bake, I have the method and flow-of-events in my head too. I’m not that bad! But I always carry little scraps of paper into the kitchen with the ingredients and quantities scribbled on them, lest I make a mistake. It is much like owning a calculator (or an app on your smart phone!) – it provides you with the luxury of never doing the math in your head so that, eventually, you just forget how! Our mothers and grandmothers had no such luxury, so everything was in their heads. That makes it a lot more special, in my opinion. But I am digressing. 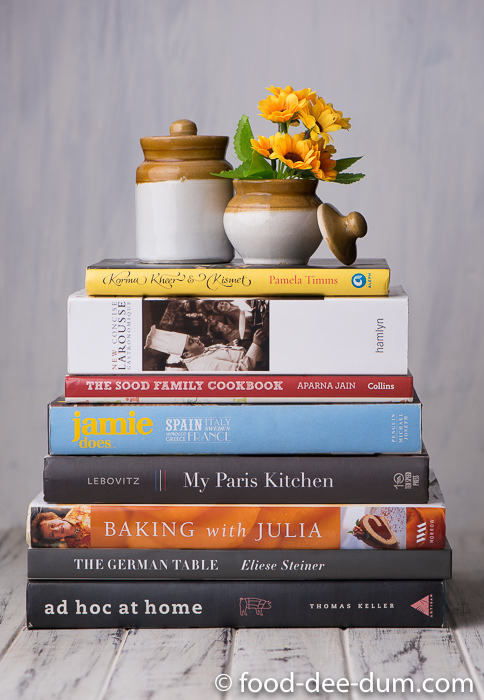 The point I was trying to make, is that this cook-book, like the websites I described above, is written in short-hand — now I’m no novice in the kitchen so with a little trial and error, or a little experienced judgement, I can find my way around these recipes. But that may or may not be the case for everybody. So I am determined to bring my favourites from the book onto the blog here and share them with you all. I hope you will love them as much as I do. The first thing that I made out of the book (for the blog) was this Raw Mango Pickle, followed by this Mulaka Pachadi. I think it’s a good note to start on, don’t you? 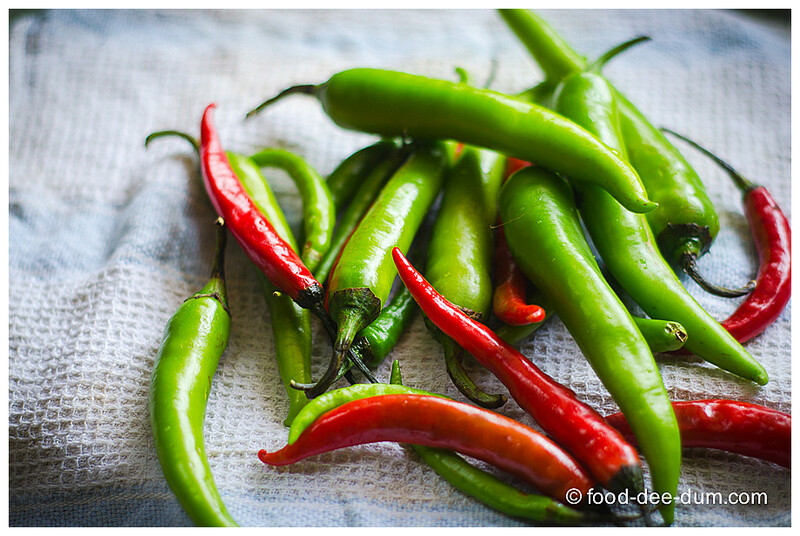 3 hands full of chillies (red and/ or green) – the original recipe said green chillies but I had a whole bunch of mixed chillies that I had used for a shoot the day before and wanted to use them all up. First, I soaked the tamarind in the warm water to let it re-hydrate and soften (not pictured). Then I washed and wiped the chillies dry. I sliced these into approximately 1/2 cm rounds and chopped up the ginger into small bits and kept them aside. 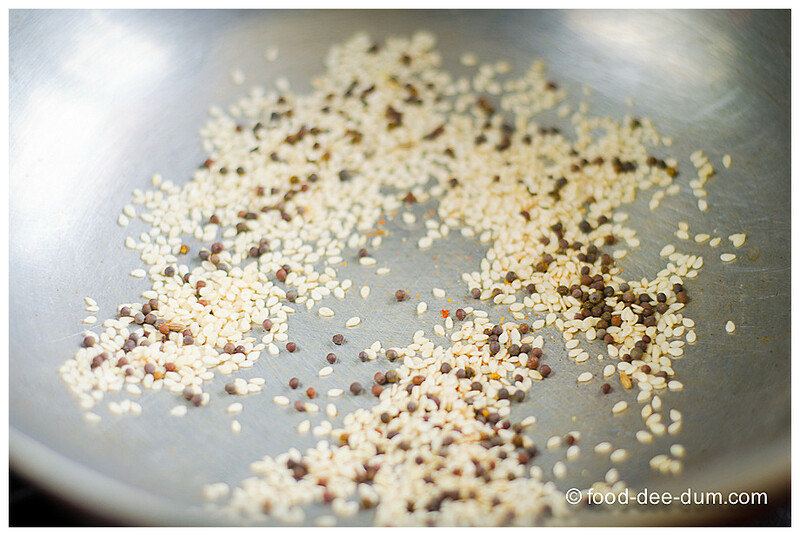 Then I dry roasted the mustard and sesame seeds on high heat until they turned a shade darker. Setting the seeds aside to cool, I warmed up the 2 tbsp of oil and fried the chillies and ginger on high heat until they softened a little, about 4-5 minutes. Removing these from the heat, I set them aside. I ground up the seeds into a powder in the smallest jar of my mixie. Mashing up the soaked tamarind with my fingers, I put it through a sieve to extract as much pulp as I could. I added another 1/4 cup of warm water to what remained in the sieve, smooshed it around and passed it through the sieve again. I placed this pulp in the kadhai, added the salt, red chilly powder and turmeric and warmed it up on medium heat, stirring to combine. 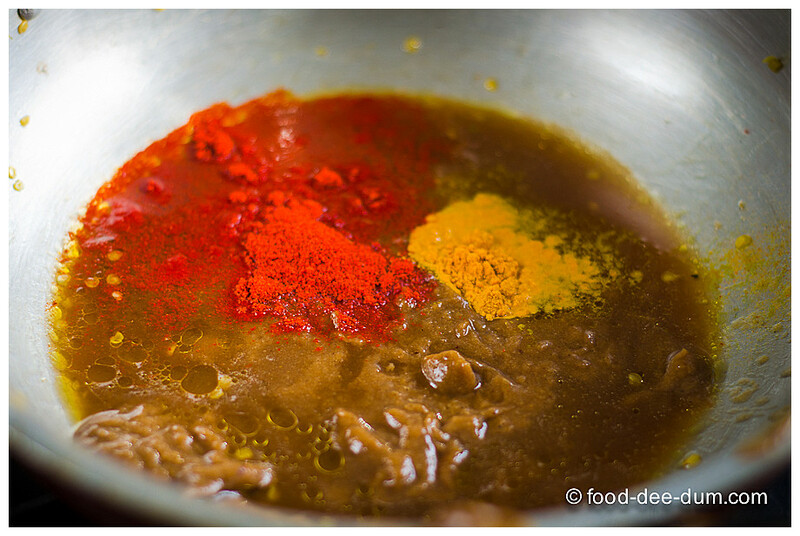 Then I added in the sesame-mustard powder and the jaggery and cooked it on medium heat, stirring occasionally, until the jaggery melted and the mixture came to a gentle boil. Then I tossed in the pre-fried chillies & ginger and cooked for a 2-3 minutes until well coated, finally taking it off the heat. Last step, the tempering. I warmed up the oil and added mustard seeds. 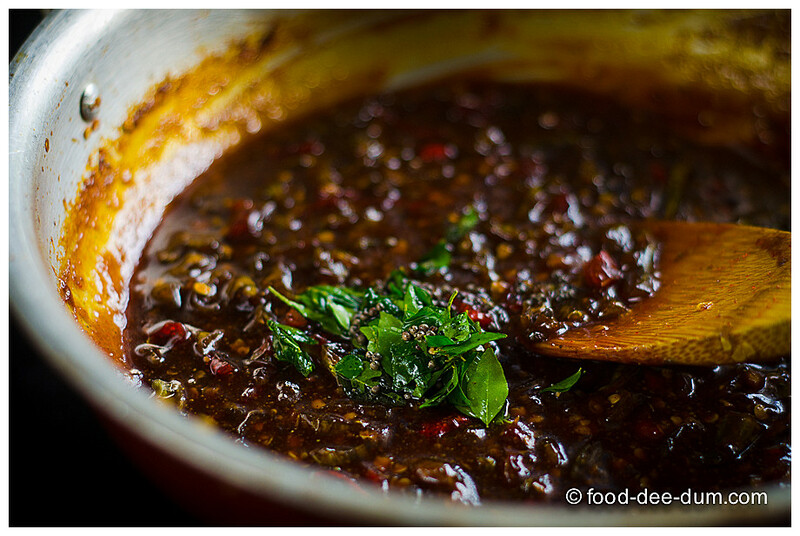 When they started sputtering madly, I added the curry leaves and turned off the heat in about 3 more seconds. 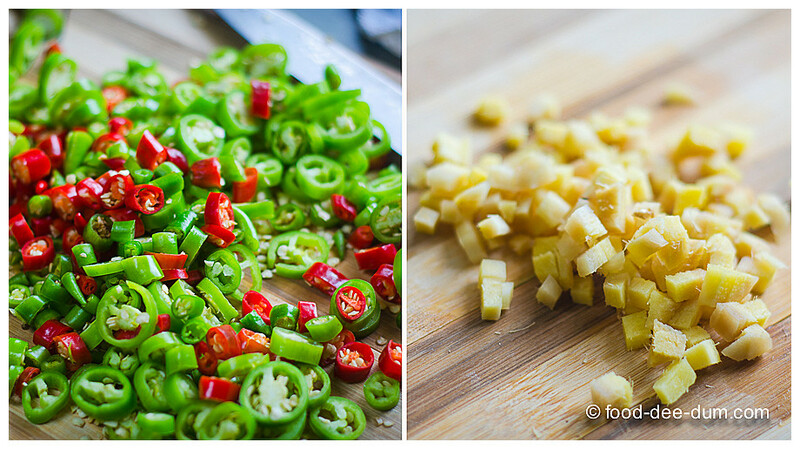 I then added the tempering to the chillies and mixed it all in. Once it cooled, I transferred the mixture to a clean glass jar and stored the pickle in the fridge. Sweet, sour and spicy all at once! Need I say more? If you would like to use readymade/ packaged tamarind paste, I’m sure you can. Just be sure to read the instructions on the package which indicate how much of the concentrate is equivalent to 1/2 cup fresh pulp. The pictures (except the final finished picture) I took were from the first attempt at this pickle, where I made a major blunder of using jaggery syrup that I already had in my fridge. I also used too much water to extract the tamarind pulp. As a result, the whole tamarind sauce base was too watery. Consequently I had to cook it for very long to reduce it, which had 2 further consequences – the chillies overcooked and became quite mushy and the jaggery+tamarind became jammy and almost candied — it set into a hard mass. I pretty much discarded that batch. But the new quantities and timings are tried and tested! So go ahead. Make it today. 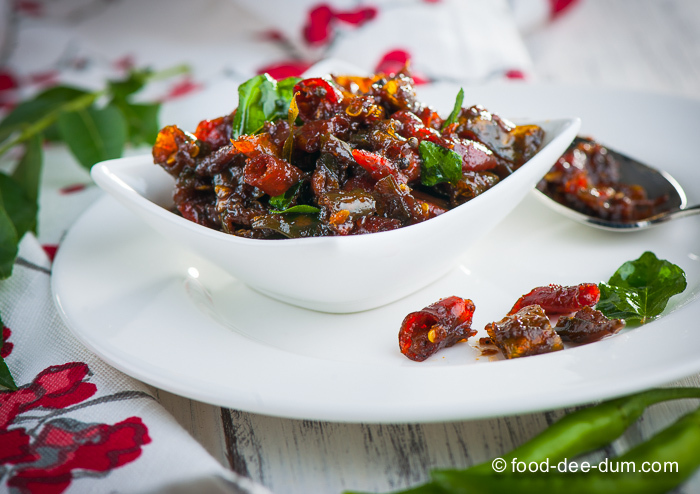 An "instant pickle", this sweet and sour chilly pickle is a lovely accompaniment to most rice, roti and vegetable dishes, giving it that extra kick. Soak the tamarind in warm water and leave to soften. Wash & dry the chillies. Then slice them into ½ to ¾ cm rounds. Also chop the ginger into small bits. In a kadhai or wide bottomed vessel, toast the mustard and sesame seeds on medium-high heat until they turn a shade darker and are fragrant. Remove from heat immediately and allow to cool. Grind to a powder when cool. 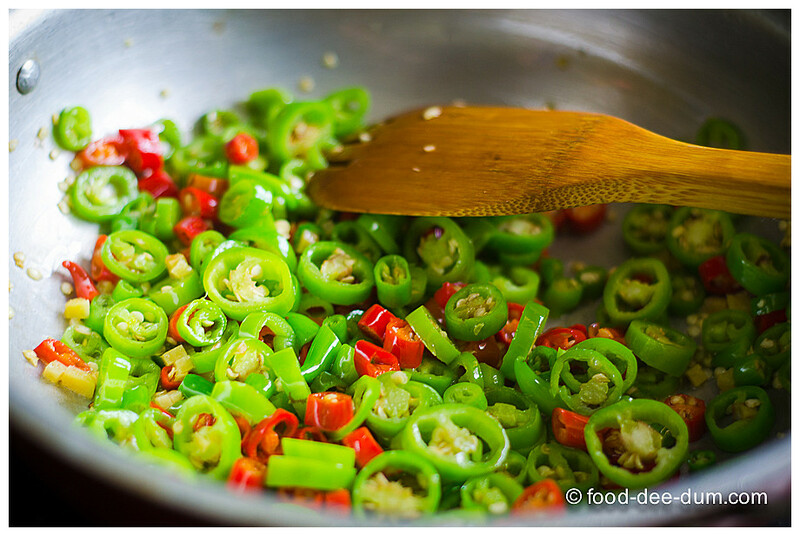 Heat the oil in the kadhai and gently fry the chillies & ginger until they soften a little, about 4 minutes. Remove from heat and keep aside. Extract the tamarind paste by passing it through a sieve, adding another ¼ cup warm water to the remains and extracting a bit more. Place this in the kadhai along with the salt, turmeric and chilly powder and heat until warmed through and well combined. 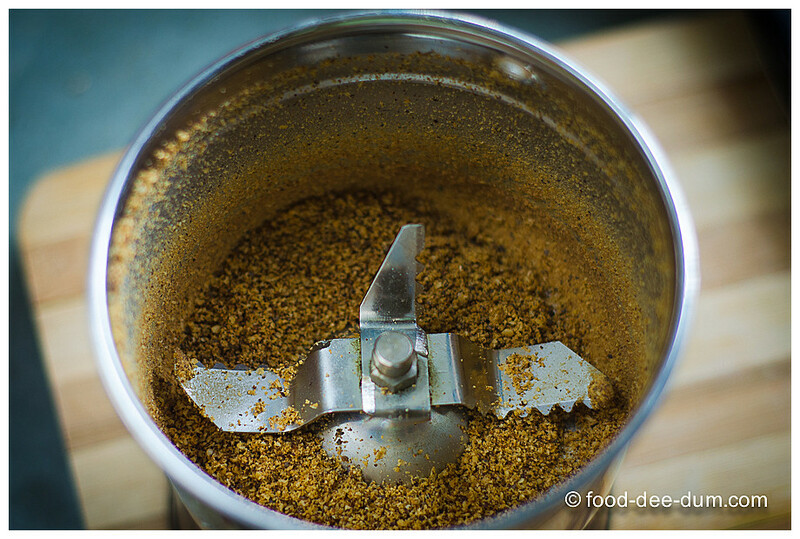 Add the sesame-mustard powder and the jaggery powder and cook on medium heat, stirring occasionally, until the jaggery melts and the mixture comes to a gentle boil. 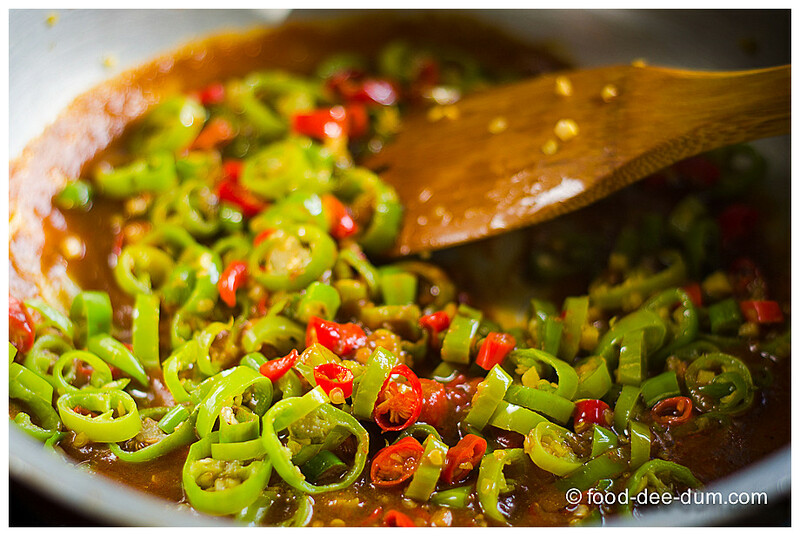 Add the chillies & ginger and cook, stirring gently, for another 2 minutes until everything is well coated with the tamarind-jaggery sauce. Remove from heat, cool and store in a clean glass jar in the fridge. Keeps well in the fridge for 3-4 weeks and at room temperature for 7-10 days.